Does the Absence of Red Eye in Photos Indicate Cancer? 'Red eye' is a term commonly used to refer to a bright red pupil in photographs of people. It happens all the time in family snapshots and is something that you can easily avoid. 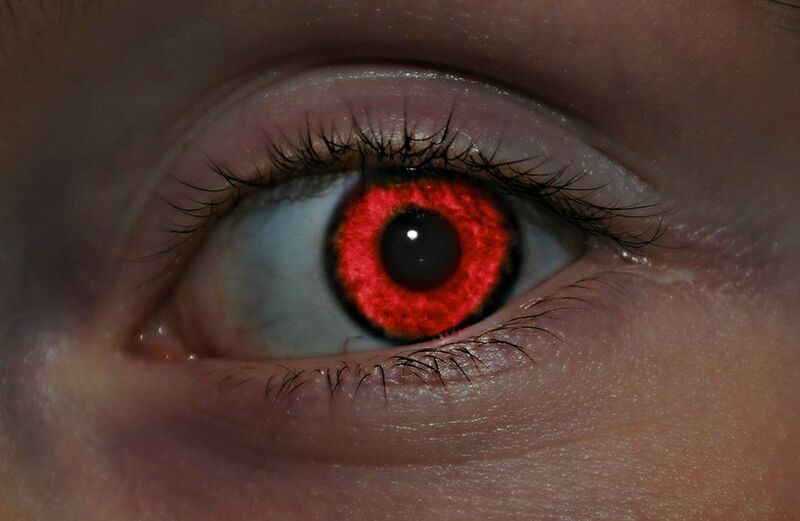 The cause of red eye is quite simple: light is reflected off blood vessels in the back of the eye. More accurately, the light is reflected so that you are seeing the light illuminating the back of the retina. It occurs when using a camera's flash and is a very common issue that has led to some common misconceptions. Rumors fly on the internet and among them is a connection between the absence of red eye and the presence of cancer. Let's clear this up right away: Not having red eyes in photographs does not mean someone has cancer. In the majority of cases, the absence of red eye simply means you took a photo the correct way (even if you didn't realize it). That said, photographs do have the potential to indicate a very specific type of eye cancer. The time to be concerned is when a photograph shows a white reflection under red eye conditions. Often, this occurs in only one eye. For example, the person in the photo has one red eye and one white eye. Retinoblastoma is a type of eye cancer in which a tumor forms in front of the retina. When photographed, the person's eye may have a white glow because the white tumor is being illuminated instead of a healthy retina. This does not mean you should go around snapping photos and flashing bright lights in the eyes of your loved ones. See an eye doctor for any concerns, they have lights that are designed to do no harm to sensitive eyes. Also, it's important to note that a white or green glow in the eyes of many animals is perfectly normal. This is part of the "green eye" phenomenon and is the same as red eye in humans. Animals have different eye structures and this changes the color that is reflected back to the camera. Red eye occurs when light enters the eye at almost the same level as the eye. Because light reflects at an angle equal and opposite to its entry (it makes a "V" shape), if bright light (such as from a flash) enters the eye at almost no angle it will be reflected back and become visible to the camera. This happens most often when the pupil of the eye is dilated, which gives the light more room to enter and exit the eye. That is why it appears most often in dark rooms and at night when our eyes naturally adjust to the dim light by enlarging our pupils. When using a built-in camera flash. Due to the closeness of the flash to the lens on most cameras. When the pupils are dilated. The larger pupil diameter allows for more light to be reflected back to the camera. The camera lens is level with the eye. Which also means that the flash may be at the same level. Preventing red eye is not as difficult as you might think. You simply need to alter the angle at which the light enters and exits the eye or change the harshness of the light. Use a flash with a tilt head. Bounce the light off a ceiling or nearby wall to create indirect light. Use a reflector to add light. This also allows your subject's eyes to adjust to a brighter light before the flash goes off. Use a diffuser on your flash. A diffuser can be something as simple as a piece of tissue or a similar semi-transparent, white material. Change your camera angle. Shoot from a slightly higher or lower position than your subject's eyes. How Does Red Eye Reduction Work on Cameras? Many cameras have a setting called 'Red Eye Reduction' and it can be a helpful way to reduce red eye. However, it is not foolproof and will not work for every picture you take. This camera setting attempts to prepare a person's eyes for the flash that occurs when the shutter is tripped. It does this by sending out short bursts of dim flashes to force a large, dilated pupil to grow smaller. In a perfect world, this should make the pupil small enough so that when the main flash of light occurs, the red-eye effect is reduced. It does not work every time and will typically only reduce red eye, not eliminate it. The real drawback to this feature is that it increases the shutter lag time. You will press the shutter button to take a photo, but the camera must first send out those initial bursts of light before snapping the photo. This means that you can miss the action or that perfect smile. It also increases the chances of catching a blink. It's best to use the other methods mentioned to reduce and eliminate red eye in your photos.